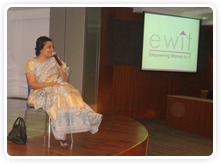 eWIT as part of its focus on 'enhancing the sustainability of women in IT' has launched a lecture series called 'Meet a Role Model' through which it will showcase some eminent and successful women professionals. 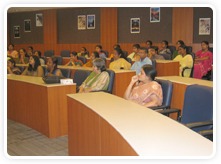 First such lectures had Ms. Akhila Srinivasan, MD, Shriram Life Insurance Co. Ltd. speak to us on 22nd January 2010 at the office of Exemplarr, Chennai. Ms. Sudha Gopal, Founding Member of eWIT welcomed the audience and then went on to introduce our Role Model for the evening - Ms. Akhila Srinivasan. Ms. Akila Srinivasan started her lecture by first defining what success means to her. Her speech was truly inspirational and managed to keep the audience engaged with her well delivered narration of her life - on how she managed to sustain her career in the highly competitive financial services sector and marrying it successfully with her passion for social welfare and development. She said that she started her career as Management Trainee in Sriram Group companies after finishing her postgraduate studies and continued her 25 years of career in the same organization. She explained how the select group of trainees were personally trained by the Chairman of the group and went on to learn the leadership style hands-on. She also explained her reasons for her foray into CSR activities and how she spearheads this initiative within the group. Besides all this, she is also the Honorary Consul for the Kingdom of Netherlands and State President of the Art of Living Foundation. She dedicated her success to the immense support that she derives from her family (spouse in particular) and her time management skills. She insisted that right living, right conduct and associating with right people ('sathsang') act as the catalyst to achieve success in life. The audience were quite interactive and the discussions that happened after her speech were very lively. Overall it was a great evening spent with a great Role Model! May we meet more such women leaders as part of this series.